EARLY LAST WINTER, a friend and I launched a narrow skiff out of Flamingo, the southern-most part of the Everglades, and headed deep into the backcountry to fish for snook and baby tarpon. We ran across the giant Whitewater Bay area and then veered north through a series of winding canals and remote lakes bordered by red mangroves. Still farther, we cut through a narrow canal that scraped the sides of the skiff, then skimmed across another lake and through yet another channel barely wide enough for the boat. Finally, we reached an area of small, nearly pure freshwater lakes. Mangroves and sawgrass lined the shore, and the water was very clear in most places but tea-colored in others. We could see the dark bottom. My friend killed the engine, glided to a stop, and then started poling near the shoreline. I stood on the bow, 9-weight in hand, and tied on a red-and-white Sea-Ducer, a classic snook fly. I thought about using a black pattern but figured I wouldn’t have been able to see it well against the dark bottom. Overhead and around us, clouds and lingering haze diminished our visibility. Unfortunately, I didn’t think about the difficulty the fish might have spotting the white fly against a hazy sky. Eventually, we saw a snook cruising the shoreline, and I launched a cast that landed two fish-lengths ahead of it. The fish kept going as if the fly was not there. The next two also ignored my presentations. Then a big one gave chase but lost interest—or perhaps he lost sight of the fly. My friend kept encouraging me to change flies, but I kept casting the white-and-red pattern. Nothing. Exasperated, he told me he would cease polling unless I changed flies; so, I switched to an old black Crystal Shrimp. I hooked and landed the next two snook and later got one of the most spectacular strikes I’ve ever seen while fishing a streamer fly. I started retrieving the fly in order to make a more accurate presentation but noticed a big, conspicuous wake rushing across the water. The wake disappeared a yard behind the fly. A split second later, the surface exploded with baby silver king and singing line. The young tarpon ran 10 yards toward the shoreline where he erupted from the water, did a cartwheel, slapped mangrove branches with his tail, and spit the hook. I, on the other hand, had hardly moved, had not even tried to set the hook. It was simply spectacular. We took more than a dozen snook that day, and they would take only black flies. In certain situations, basic black is the only color in fashion on the water. And yet, with the exception of anglers who chase big tarpon, black is not popular. A fly known as Black Death, which is mostly black with some red, accounts for taking many a big tarpon. But most anglers don’t use black flies. They are missing a lot. Brackish water canals often have a mix of baby tarpon, snook and black bass. A small black fly will take all of them. Think of the factors—such as the color of the sky, or the water, or the bottom—that influence a fish’s visibility and how the profile of your fly will appear in a particular environment. Then determine accordingly which fly to use. Black flies are ideal for low-light conditions in the early morning and the late evening, on cloudy days, and at night, or in murky or off-color water. It’s also important to understand how fish themselves are colored. Most game fish and baitfish have a camouflage pattern called “countershading,” which is a gradual change of coloration from bottom to top—a very light, often white belly, through midtones, and a dark back. In this manner, seen from above (and especially against a dark bottom) the fish is hard to see. Likewise, if a predator is looking up at the prey against the light sky, especially during low-light levels, the baitfish’s white or light belly is a good camouflage. A friend of mine, Aaron Adams, is a marine biologist, fly fisherman, and diver. His experiences under the water shed light on the subject. He says, “On bright sunny days, looking up at baitfish against the sky, I manage to see the fish. But on cloudy days, it’s real hard to see those white bellies against a dull sky. But I can see dark colors easily in any light. If all of this still does not convince you, take this basic test. The next time you fish the backcountry and the water is muddy or off-color, cast your white or yellow fly 30 to 50 feet from the skiff. Try to watch it as you retrieve it. Probably hard to see, eh? Now tie on a black fly, preferably a bit overdressed, and try to follow it as you bring it in. The black pattern is easy to see, even when it’s not very close. Do not underestimate the importance of being able to see your fly, especially when sight-casting. If you can see your fly, you have a better chance of determining the quality of your presentation—you can decide whether or not to cast again or to reposition the fly or to work the fly for the fish. And the same goes for when you are fishing a shoreline. You can fish much more effectively when you can see the fly. When fishing at night for snook and tarpon in moving water, such as channels or the mouth of a creek or river, my first choice is a black fly. I prefer a pattern that is a little more overdressed than usual and a little bigger than I’d use for the same fish on the flats. For example, if I am sight-casting during the day, I might use a size 1 Crystal Shrimp or Sea-Ducer, but when I am blind-casting the same area at midnight, I will pitch a fatter 1/0 or 2/0 version of the same pattern. Yes, I know it feels funny to cast a black fly in the middle of the night where you can’t see it at all, but trust me, the fish can see it just fine. But remember: Don’t work the fly too fast. In very clear water with dark bottom, black flies are very productive. But in clear water with light bottom, such as you’ll often fine when beach fishing, I am more likely to use a lighter pattern that matches color of the sand. For some reason, certain species of game fish seem to be more attracted to black flies than other game fish. My experience has taught me that bait chasers, such as snook, sea trout, and baby tarpon, go after the dark patterns. 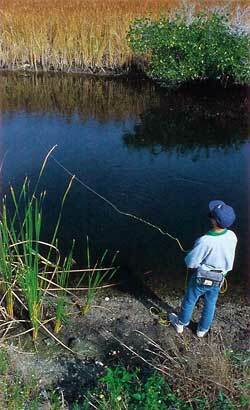 But most bottom feeders, such as redfish and bonefish, have not proven to have a preference for black flies. I have taken a few reds and even bonefish on black, but not many. The one exception I can think of is the black drum. In his case, I have done well using a black Clouser that is weighted heavily enough to keep the fly mostly on the bottom. So, if I find myself fishing in muddy waters for redfish, I will likely change from a white-and-red streamer to an orange, orange-and-brown, red-and-brown, or orange-and-red, pattern. That is, I’ll fish a pattern that is not as light as white or yellow but not as dark as black. Dolphin have also shown an affinity for black flies. If you find yourself way out on the blue water and the dolphin are following your fly but not taking it, tie on a black pattern with a weedguard. Cast it right on the seaweed, and drag it slowly through. I have seen dolphin break the seaweed patch to take a mouth full of fly and sargasso. In the backcountry, if I need or want the fly to stay on top or close to the surface, I’ll use a Sea-Ducer or a streamer with a deer-hair head. For most of my sight-casting or shoreline hunting, I usually like a fly that sinks a bit faster; so, here I prefer a Crystal Shrimp. And lately, I have been using a new fly that is made out of marabou—tail, hackles, and all. 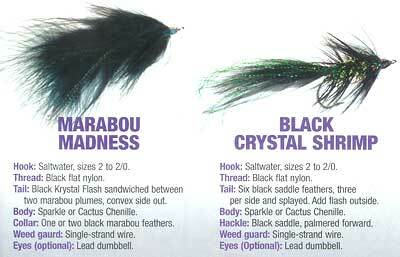 I call it Marabou Madness and tie it large: 3 inches to almost 4 inches and often weighted. Most of my black flies have some type of weedguard to deflect loose grass or to help me fish structure more thoroughly. And if I decide to use a popper in off-color waters, I often want a pattern that will show a good silhouette against the sky; so, quite often I use a black popper. I’ve taken my share of snook and big sea trout on a black popper. All my backcountry fly boxes have some black flies. And it’s going to stay that way. So, if you are fishing early morning, late evening, or all night long, do what I do: Dress some flies in basic black.